It may sound selfish to be talking of self-love. Yet it isn’t at all. Here is why: only when we love ourselves do we take care of ourselves and only then can we take care of others. Let’s use a metaphor that illustrates this perfectly: say you are swimming with someone who gets leg cramps. If you are not a confident, strong swimmer, how are you going to help this person? You might even drown in the rescue attempt. This is exactly how things unfold in life. We care and over-care and, one day, we crash, because we have forgotten to take care of ourselves. To take care of ourselves means to strengthen and nurture ourselves physically, mentally and emotionally. This is a day-to-day process and it takes awareness, commitment and discipline to develop. How do we build a strategy of self-care? By implementing a number of choices in the four main areas of our lives: the physical, the mental, the emotional and the spiritual. In my book, 7 keys to Serenity, I expand on this at length in the key of D––which stands for Discipline. So, again, happiness––true, authentic happiness, that is––is not something that just happens to us. It is a state of being that unfolds from the implementation of a certain number of things in these four areas. For example, in the physical arena, it requires proper nutrition and exercise. This in turn, has an effect on our mental, cognitive abilities and vice versa. Wellness also affects our emotional states, and these, in turn affect our physical wellness and health. We have seen how anxiety sabotages our immune system. It is all interconnected. To be truly happy is to play life by heart. In other words, to involve the heart’s intelligence ( Yes, there is intelligence not just in our brains!) When we do that, we avoid the many tricks the subconscious mind plays on us and bring ourselves to live in the moment, savouring simply the fact of being, of breathing, of participating to life, of being part of the universe. 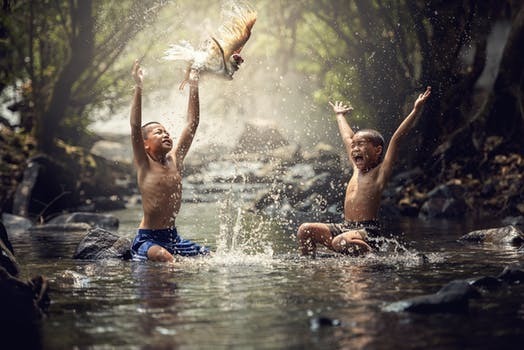 We learn or re-learn to play, to be playful and reconnect with the child in us­––a child who never really goes away. We introduce meaningfulness into our lives, we contribute to help in areas of life that we believe are important, not just for ourselves but for society. Some will feel compelled to volunteer for specific causes. Others write about them or engage in activism or play benefit concerts. It doesn’t matter how big a difference we make, as long as we make one. This ties in with selflessness, in other words, with activities that have nothing to do with self-reward or recognition. Last but not least, true happiness is created by gratitude. Or is it the other way around? To be grateful is to be truly happy. As I point out in my book 7 keys to Serenity––now available on Amazon––Gratitude is an attitude. It is not linked to the act of receiving. It is about appreciating every moment of our lives and being grateful for having the opportunity to participate to life…or having participated in case we lie on our deathbed. True gratitude, like true happiness, are inseparable and share a common essence: not linked to outside circumstances. They are created within. So now, Nathaniel Hawthorne’s quote about happiness resonates more profoundly with us doesn’t it?